Snow makes the list this year, understandable given the Snowpocalypse and Snowmageddon that gripped much of the Eastern U.S. in the weeks preceding Ash Wednesday. IPods also made the list after the Bishop of Liverpool asked people to consider praying instead of listening to them. This year a celebrity, Justin Bieber, cracks the top 100. He beat out the Jonas Brothers, 64 votes to 11; draw your own conclusions. The list largely tracks last year’s list. 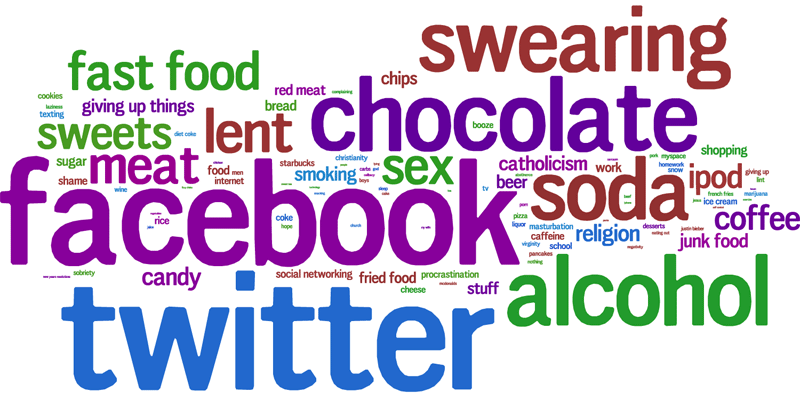 It draws from 40,000 tweets retrieved February 14-20, 2010. You are currently browsing the OpenBible.info Blog blog archives for February, 2010.